The white Tiger Lodge is a popular rest house in Bandhavgarh because of horde of reasons. Leisure stay is promised in the 20 elegantly designed and furnished rooms at the White Tiger resort. The rooms are equipped with attached toilet/bath along with running hot and cold-water facility available to all the guests. The multi-cuisine restaurant at the Lodge offers delicious delicacies prepared by trained chefs with an ambience to match. Evening sittings on independent porches gives opportunity for seeing the beautifully lit sky with stars at the Lodge. 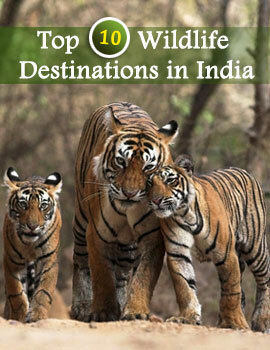 It also arranges for regular safari rides for touring the sanctuary for the guests. The Jabalpur airport is at a distance of 121 miles from the sanctuary while the Khajuraho airport is 131 miles away from the sanctuary. From these airports one can hire a bus or a car to reach the place. The nearest rail junction from Bandhavgarh Wildlife Sanctuary is Umaria, which is 22 miles away from the park. The place is also well connected by road.